Celebrating the life of Haywood Allen, Jr.
Be the first to share your favorite memory, photo or story of Haywood. This memorial page is dedicated for family, friends and future generations to celebrate the life of their loved one. 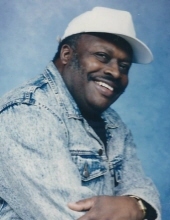 Obituary for Haywood Allen, Jr.
Haywood Allen Jr., also known as “Duke”, was born to the late Mildred Allen and Haywood Allen Sr.
Haywood was born July 9, 1942 in Birmingham, Alabama. He was the eldest of his siblings. Haywood entered eternal peace on April 8, 2019 at U.M.D.N.J. with his loving wife by his side. Haywood went to school in Birmingham, Alabama. He later on relocated to Newark, New Jersey. Haywood met his wife, Hattie Sims, and they remained married 33 years until his death. Haywood worked at Revlon in Irvington, NJ where he was a machine operator for 31 years until his retirement in 2006. Haywood was a loving man who took his family he loved to fish and shoot pool. He also had a flair for fashion and loved wearing hats. Haywood was preceded in death by his parents. Haywood leaves to cherish his memory: his wife, Hattie Allen; stepdaughter, Iris Sims; step-grandchildren, Diamond Sims, Aldoray Sims and Raymonda Sims all of Newark, NJ; two brothers, Clarence Allen of Newark, NJ and Robert Allen of Irvington, NJ; one sister-in-law, Jeanette Allen; one special aunt, Rose Mae Allen of Birmingham, Alabama; and a host of nieces, nephews and cousins. This Online Memorial has been created to commemorate the life of Haywood Allen, Jr. Leave a message on the Tribute Wall to share your favorite memories and offer words of sympathy and comfort. To send flowers or a remembrance gift to the family of Haywood Allen, Jr., please visit our Tribute Store. "Email Address" would like to share the life celebration of Haywood Allen, Jr.. Click on the "link" to go to share a favorite memory or leave a condolence message for the family.